Moung Ohn Ghine, A.T.M., C.I.E. ​Majesties King Edward V11 and Queen Alexandra. I am highly pleased to see by the telegrams to hand that you are the first Burman non-official in the Province who has had the honour of being called to the order of C.I.E. ship. I am justly proud of this as being also a native of Burma. I hope you will be spared many years to wear the decoration and that in future years this may blossom to a K.C.I.E. ship. Once more congratulating you on the high honour done to you by our gracious Queen Empress. The opening of the year has brought you luck, of which I am very happy to hear and hope that further honours will be bestowed upon you. Wishing you and yours a very happy New Year. I shall call over to see you at your place about 10am. Other letters refer to his extensive religious and charity work e.g. Dufferin Hospital, one of the wings was named after him and his wife Mah Yait, St John’s College, The Rangoon Volunteers. His good character is vouched for by a number of people including Rev’d. 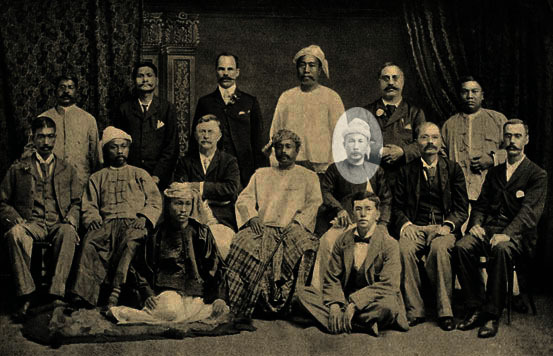 John E. Marks, Principal of St. John’s College 1875,The Bombay Burmah Trading Corp., who mention in one letter the valuable service he rendered in Mandalay 1885, around the time of King Thebaw. Further letters refer to his appointments as Honorary Magistrate and Municipal Commissioner. His own account of a visit to the U.K. during which he stayed for at time at the home of “my old friend and teacher the Rev’d. Dr. Marks.” By accepting many invitations he is entertained by leading companies and figures of the time. He was present at the Coronation as the Representative of the Province of Burma. and is on our recommended reading list.